Home / QuiBidder of the Week – Jenny F.
QuiBidder of the Week – Jenny F.
Congratulations to our newest QuiBidder of the Week, Jenny! 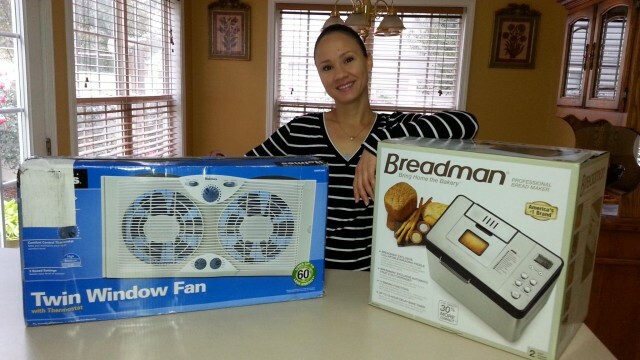 Continue reading to learn about her experiences with QuiBids, like how she won the Twin Window fan AND the Breadman Bread Maker, both for under $1.00! Click here to enter to become the next QuiBidder of the Week. When did you first sign up for QuiBids? Tell us about a Recent QuiBids Win? “I’ve always been crazy about a Break Maker. I saw so many QuiBidders talking about how great the machine was on Facebook, so I decided to start bidding on one and I got it! I won this $108 Bread Maker for $0.58 and I only used 13 Voucher Bids. Let me tell you, that machine rocks! I love it. What’s the most fun you’ve had bidding? Have you ever given your QuiBids win as a gift to someone else? What’s the most bids you’ve ever won from a single QuiBids Game? Besides bidding in auctions, what’s your favorite thing about QuiBids? What advice would you like to give to a new QuiBidder just starting out? Thanks Jenny for taking the time to tell us about your successes on QuiBids! Do you want to share the story of an awesome win you received? Take a photo of you with your product, tell us a little about it via the entry form here, and if you’re story is chosen you could receive a $50 gift card of your choice! QuiBidder of the Week – Dagmara P.
QuiBidder of the Week – Carletta B.
QuiBidder of the Week – Daniel A.